Gibraltar, located at the crossroads of the Atlantic and Mediterranean shipping lanes, is ideally placed to attract and provide services to vessels of all sizes and types. The number of large yachts under construction has more than tripled over the past ten years and the Gibraltar Government recognises the importance of the Superyacht sector and its’ potential for growth. 2012: In a move to stimulate the growth of the Superyacht sector and to encourage these vessels to use Gibraltar as their longer term berth, the Government of Gibraltar abolished import duty for vessels over 18 metres. 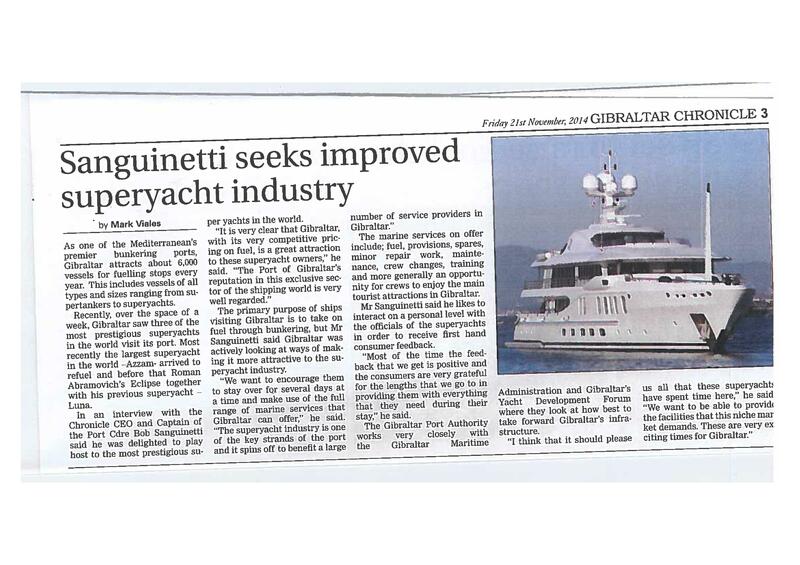 There is a drive to change and attract larger Superyachts, not only from the Government, but by Gibraltar Yacht Registry and the Gibraltar Port Authority. Gibraltar Superyacht Forum 2013: With growing numbers of yachts and increasing sophistication of clients it was noted by Patrick Coote, Global Marketing Director of Fraser Yachts that is important that marinas promote attractions and facilities in their hinterland. Facilities such as luxury restaurants, top golf courses, schools and air links encourage vessels to stay longer in a marina and Gibraltar is ideally placed to offer these. 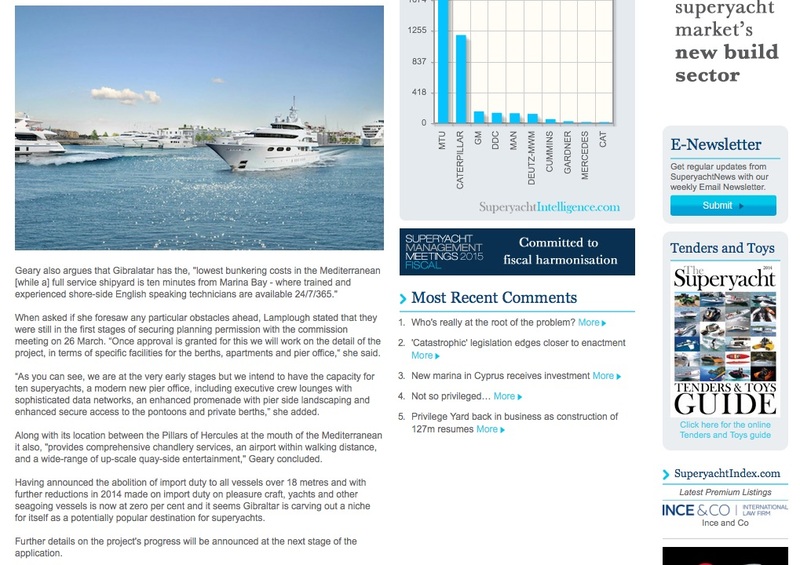 Gibraltar International Magazine reported in 2014 that the Gibraltar Yacht Registry were introducing new services to attract more of the bigger yachts with three new products: A new fee regime for the registration of very large yachts, the ownership of vessels by High Net Worth Individuals and a new ‘Yachts Under Construction’ registration category. With 146 new Superyachts launched in 2013 alone, (that’s around 3 per week), this elite industry is constantly growing. Thanks to competitively priced fuel, Gibraltar already participates, but infrastructure improvements for Superyachts and large luxury yachts are needed to encourage them to adopt Gibraltar as their home port. This is essential if we are to compete with the €50million mega-project proposed by our neighbours in Alcaidesa. Ocean Village’s new Superyacht & Luxury Yacht berthing and short-stay and rental apartment design has been conceived to do just that. Why have no Superyachts chosen Gibraltar as a home? Having consulted with Superyacht captains who visit Ocean Village, local suppliers who deliver to them and industry experts, we know that this is due to a lack of appropriate Superyacht facilities. Significant investment is required in order to provide the infrastructure, amenities and resources that will attract these highly lucrative vessels to the Rock. 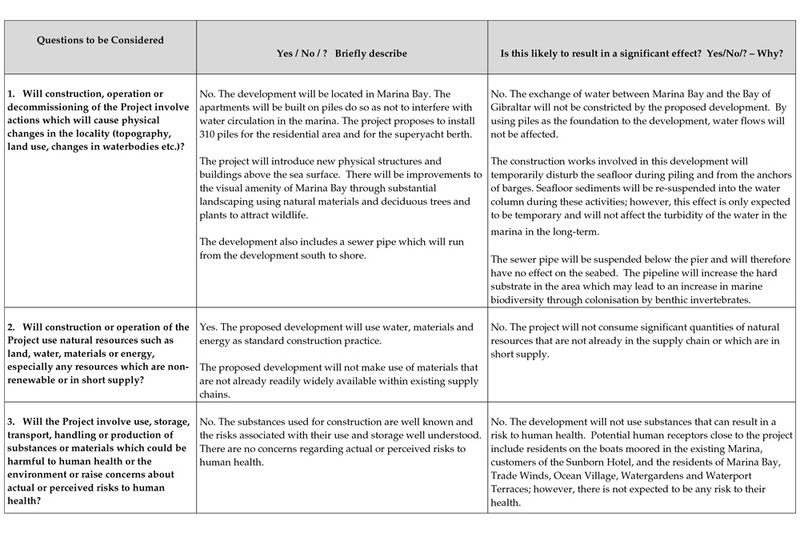 The above project plans, both of which were granted approval by the Town Planning Department in years 2007 and 2011 respectively, have been completely re-designed to take into account both feedback from the public and also the Government’s commitment to attract more Super and Mega-yachts to Gibraltar. 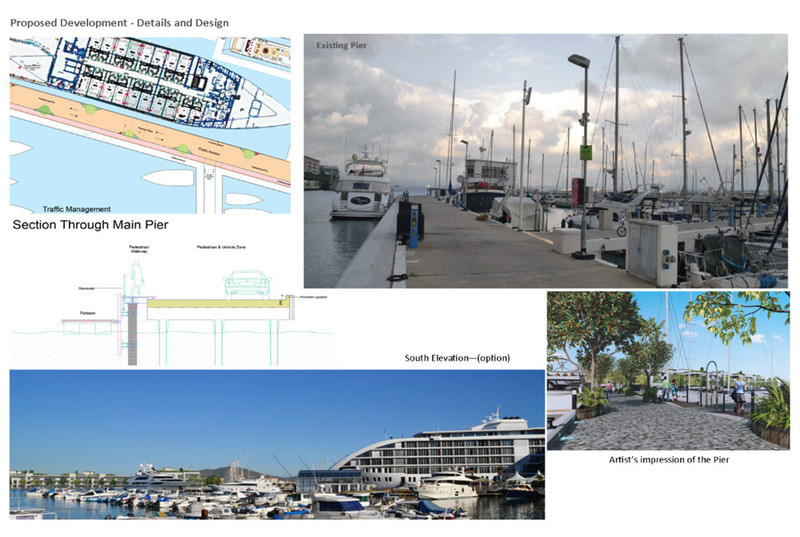 In a proposal for Gibraltar’s Development & Planning Commission, Ocean Village has outlined ten luxury Superyacht berths with secure access, executive crew lounges similar to those available to business class airline passengers, sophisticated data networks, pump-out facilities, significantly enhanced electricity supplies, spa style facilities as well as storage, workshop and laundry services. CCTV will be in place to ensure peace of mind for the high-value Superyachts’ owners, guests and crew. pools to play areas, alongside extensive pier-side landscaping with trees every 5 metres and beautiful atmospheric lighting. Water will flow freely beneath the structures which will be on stilts so as not to disturb marine life. 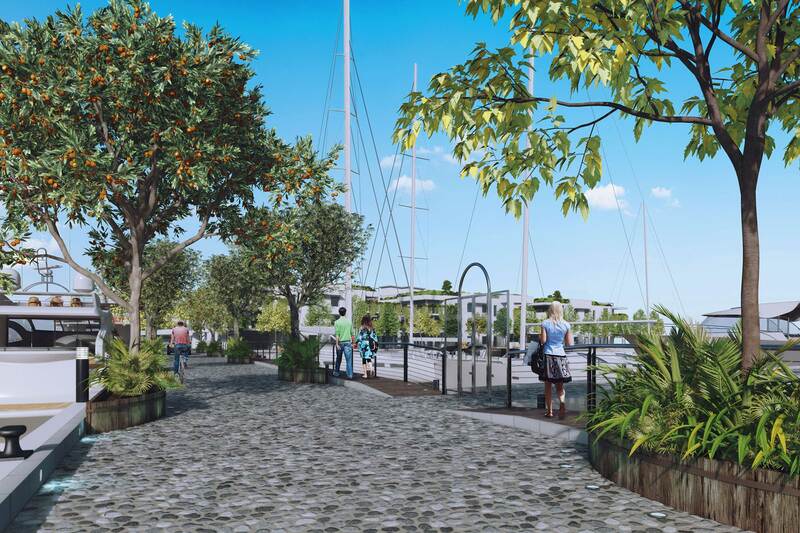 The full length of the main pier will be pedestrianised (apart from the boat berthing pontoons off the branch pier which will be private to give security to the boats) with electric buggies and bicycle hire also available. Eco-friendly cross-laminated timber is being considered as the construction material because it is fast to erect whilst minimising waste and disturbance to the environment. It is anticipated many of the crew members will stay in the short-stay apartments. Furthermore, the walkway, which will be open to pedestrians, would be extended to create around half a kilometre of tree lined promenade leading to a mirador at the end, providing a viewing and seating area which can be appreciated by all. This is a major extension to the existing pedestrian access and will be open to the public. 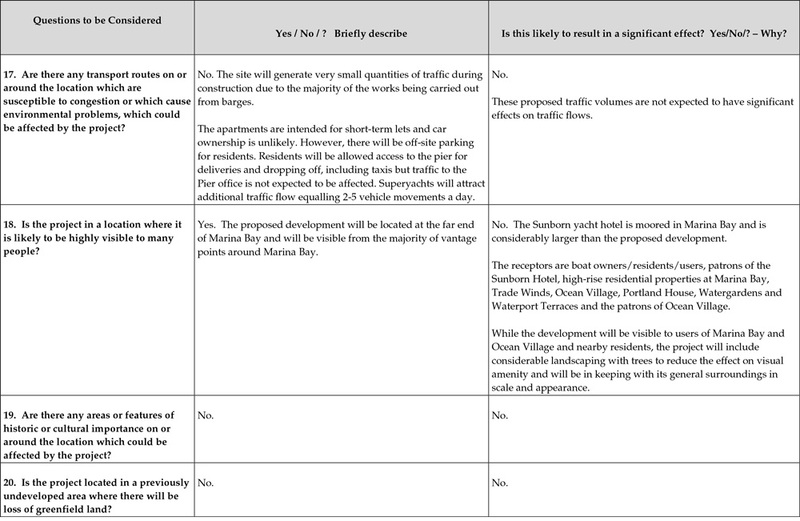 This report is the result of screening exercise carried out to check if the proposed Marina Bay Apartments & Superyacht berths could possibly be classed as ‘EIA Development’. 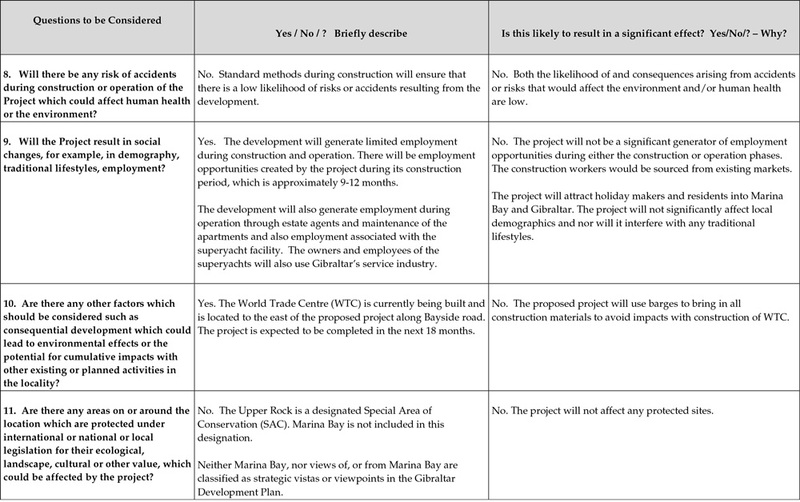 The Gibraltar Town Planning, EIA Regulations, 2000 (1) provides List 1 and List 2 developments which require EIA. The proposed development is not a ‘List 1 Development’. 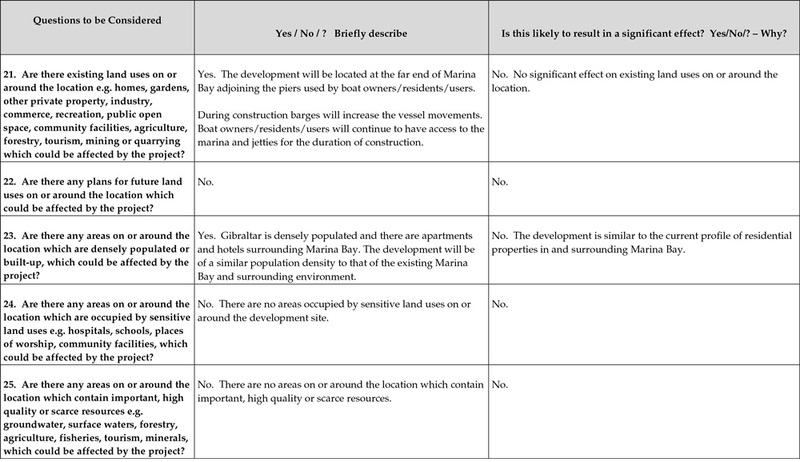 With regards to the List 2 Development, the Gibraltar Town planning regulations provide a Selection Criteria for Screening List 2 Development which has provided the basis for this screening report. The questions in the screening checklist are intended to help determine whether significant effects are likely or not. column 1 sets out the questions to be considered as per the screening criteria. column 3 assesses whether it is likely to result in a significant effect and provides a justification. The summary is provided at the end of the table. The proposed development, its location and design development are illustrated overleaf. The proposals do not fall within the categories of projects in List 1 of the EIA Regulations. 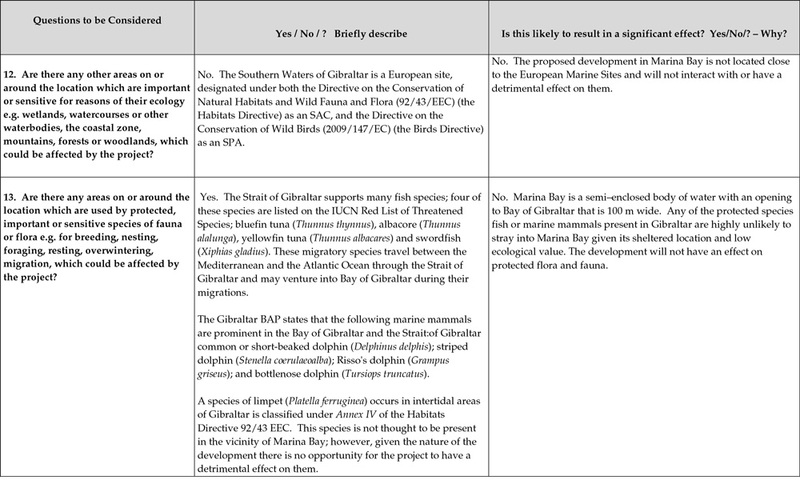 While considering the screening criteria in List 2 ERM has assessed whether the proposals would be likely to give rise to significant effects on the environment ‘by virtue of factors such as the development’s nature, size or location’. 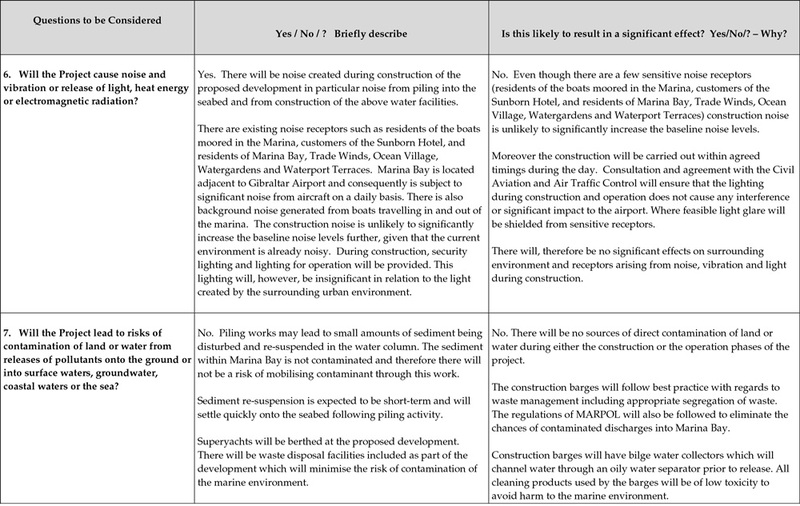 This screening assessment has concluded that the proposed development during construction and operation is unlikely to have any significant effects on the baseline environment due to its small scale, its sensitive design and the adoption of good practice construction techniques. The development is located in an existing operational marina and has been designed in accordance with accepted guidelines and includes various design options to mitigate environmental impacts and provide some enhancements. Ocean Village has recently appointed Captain E.S Geary, a recognised and accomplished naval engineer who possesses an extensive and wide-ranging knowledge and experience in marina design, construction, safety requirements and operations world-wide. Prior to his appointment as a consultant and technical advisor, Captain Geary took it upon himself to voice his support for the project, which considering his status as a marine specialist well versed in all aspects of constructing and operating marinas was very welcomed, as expert support further reinforces the great importance of attracting Superyachts to Gibraltar. His credentials speak for themselves-he is a RICS accredited and qualified Charter Surveyor in admiralty and maritime and we are very pleased to welcome him within our organisation to ensure that our Superyacht berthing facilities and associated infrastructure adheres to all safety requirements and all environmental aspects are carefully considered. 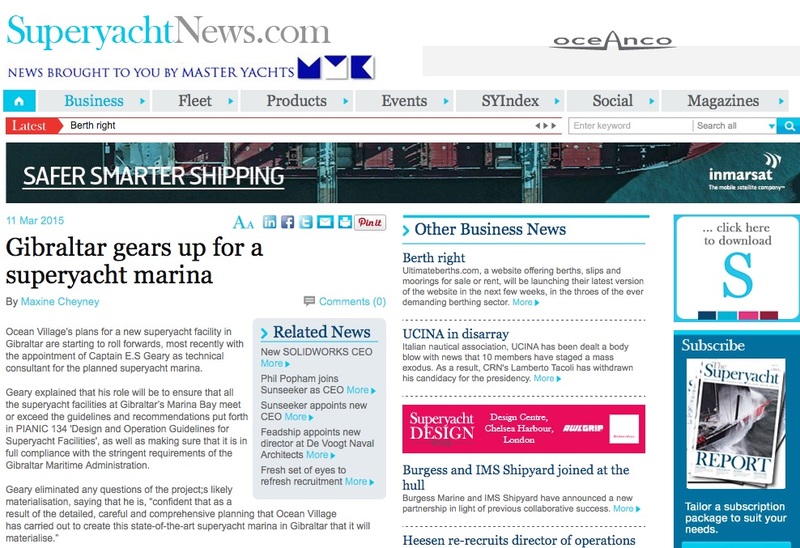 A cutting from an article recently published by SuperyachttNews.com provides a valuable glimpse into his professional views regarding Ocean Village’s proposal for a state-of-the-art marina extension to provide the very first Superyacht berthing facility in Gibraltar with the aim of tapping into this lucrative market for the benefit of Gibraltar as a whole. Why are superyachts important to Gibraltar? A 70m Superyacht can generate an income of 8 million for the Gibraltar economy each year with a £100 million Superyacht that increases to > £15 million. Gibraltar should be a premier location – we are lagging behind marinas in locations like Malta and Italy and Spain which have better equipped berths. But infrastructure for Superyachts cost many millions. Superyachts is a huge market, with room for more. 70% of the Worlds superyachts are in the Med. If our new facility is only 60% full it should bring £75m in to the Gibraltar economy – its an important investment. It would only take 10 larger superyacht home berths in Gibraltar to equate to 7.5% of Gibraltar’s GDP. This would have a positive impact on every Gibraltar resident. 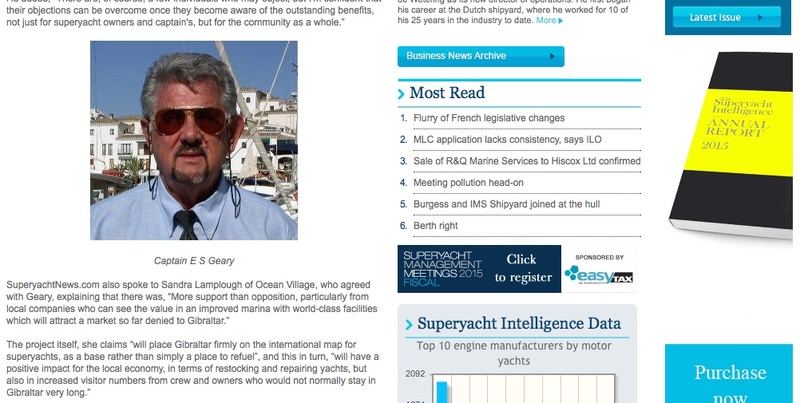 How are super yacht berths funded? Super yachts have a greater benefit to the economy as a whole than the marina that berths them. Fact. This is recognised internationally is why the EU gave a grant of around 30 million euros to La Linea’s Alcaidesa Marina. La Linea Alcaidesa Marina has announced its intention to add Superyacht berths as it has the infrastructure. Government funding such as that given for the new 700 berth municipal marina is not available to Private marinas. Private marinas are typically paid for by the property development. Berthing fees will not generate sufficient funds to cover the capital investment. Examples – Several decades ago Marina Bay Phase 1 was funded by the construction of Britannia House, Neptune House and the Tower. The berthing fees maintained it from then on in a minimal way. Marina Bay had not received any substantial investment from 1979 until when Ocean Village bought it. Sheppards marina was renewed and funded by Ocean Village Phase 1 Property Development. 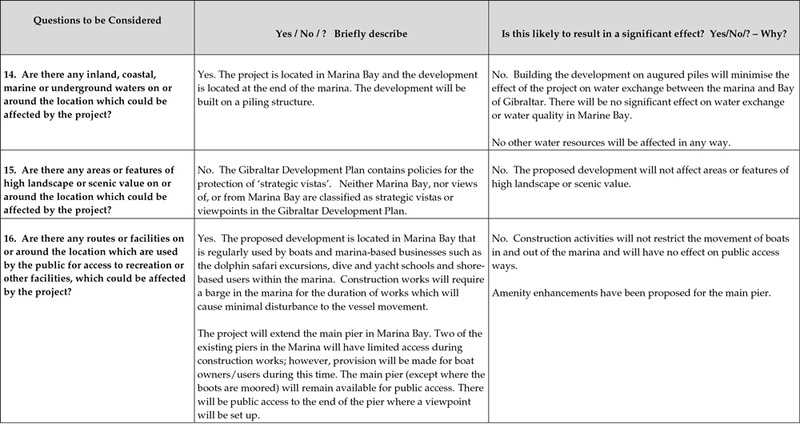 Marina Bay Refurbishment and expansion (including the recently DPC approved replacement pontoon programme) will need to be funded by development. The improvements needed to the infrastructure of Marina Bay to allow it to offer “home” berths to Supeyacht will cost many millions. Why do Superyachts not stay longterm at present? Currently Gibraltar is a Fuel stop. It is not yet a destination for the berthing of larger vessels. Power – The marina has insufficient power to cater for the Superyachts plugging in. Superyachts berthing of Marina Bay must either run down their batteries or run their engines permanently. Foul Drainage – currently Superyachts have to retain their sewage in their own tanks. Most Superyachts have their own treatment plants to minimise the waste, however, they still need pump out facilities. These do not exist at present. Adjacent Parking facilities do not exist for vehicles they use to gain provisions. Nor even for their owner if he/she visited Adjacent storage faciliites are not currently provided.Deliveries? Very limited space at present. Insurer’s requirements – Coding – Stringent insurance requirements would make it difficult for Superyachts to use the current marina as their “home” berth. Weather – Marina Bay is luckily a sheltered marina, however mooring bollards and ground chains are insufficient and vessels have to spend time and effort to lay their own anchors and supplement it with more chains. This is not the solution that Captains of Superyachts will find acceptable for their “home” berth. Berthing configuration is not ideal – this development would improve the configuration. What happened to Previous applications? In 2007 the original Waterside Villas project was approved by DPC. It was a much larger project and occupied much more space. By the time that Phase 1 and 2 were completed in Ocean Village, the recession had hit. Building in 2008-2010 was not sensible. In 2011 taking on board original comments from the first application regarding density, the footprint was substantially reduced to a single area within least used part of the marina. This had minimal effect on the berthing and had vehicular access granted in front of De Paulo’s restaurant. All apartment parking was on site. Following granting of the approval various external changes took place – the Government changed, and the new Government placed more emphasis on gaining Superyachts and undertook tax changes for Superyachts. 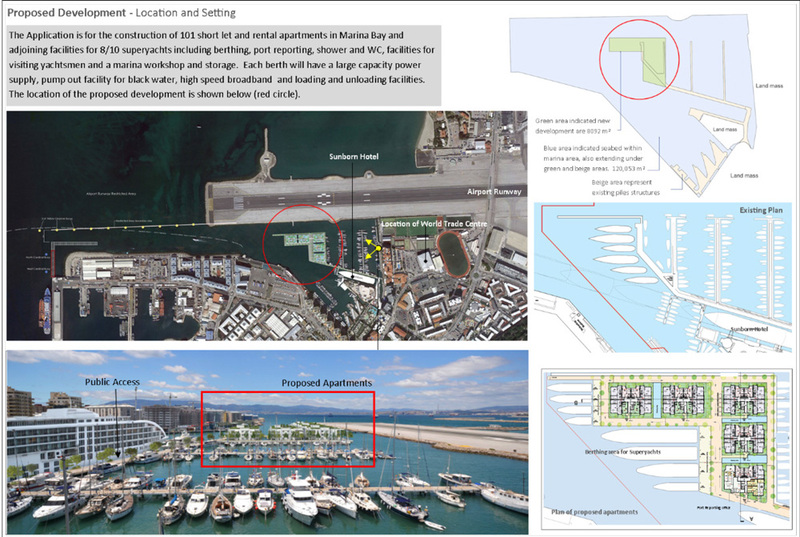 This expanded the possibilities for finally creating superyacht berthing in Ocean Village, i.e. it reduced the duty on Superyachts to zero. To complicate matters more, the Spanish made changes within the bay affecting water flows. This meant that all water flow data to-date was invalid. New reports took many months. Re-evaluating and building a Superyacht business within the marina takes a lot of time. The outline application approval was for 12 months. We were not able to obtain all information in time and that approval lapsed. 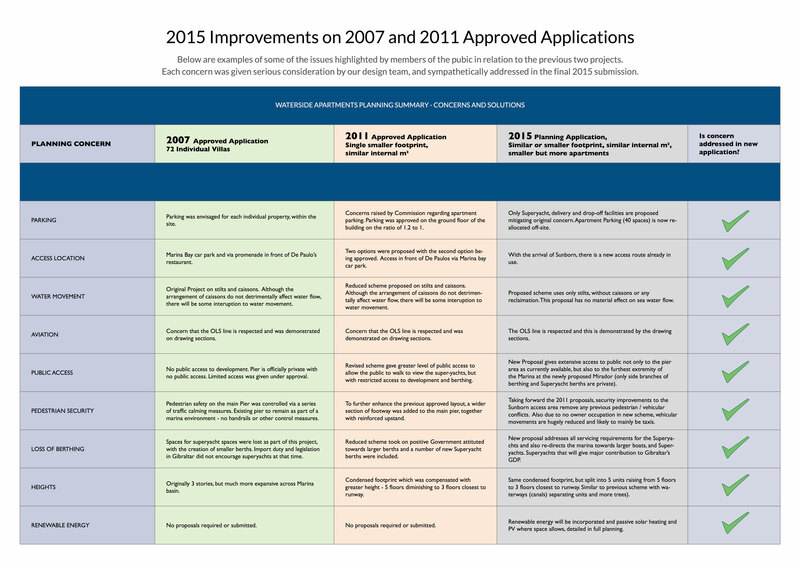 A request was made in 2012 ro an extension of time for the application which was denied as the new administraiton and DPC panel members preferred that we make a new application. Sunborn was announced by Government on the same day at the DPC meeting. The new application is not a repetition of the previous application, but an application designed to build up on the strengths of the previous application and to change the vehicular access from passing in front of the former Paolos restaurant to using hte new route to the Sunborn thereby addressing the earlier concerns of DPC members, i.e. Traffic flow and more berths and separated massing, greater public access, more security measures. This marked a distinctive shift in type of market the project was aimed at – previously it had been high worth individuals that would only buy if they had private on-site parking, now it is for short term rental tenants that will have low car ownership, and if they do own a car, parking provision will be off-site. What are the key differences between this and the previous applications? Cars – concept has been changed from owner occupier to short and long term tenants. Electric carts (golf buggies) are being considered in limited numbers. Pedestrian facilities have been improved – greater access through the pier extending to the full length of the main pier and further extend to a mirador, (only the berths on the branches off and the rear of the Superyachts are private to give them security). Pier office facilities have been improved – better customer facilities and services catering not only for the existing marina users but also the superyacht crews, these will include an executive lounge similar to airline executive lounges. Size – the original proposal was for 72 individual detached properties on 2 and 3 floors. They were much large premises. These premises are for rental and much smaller thus although there are 126 they are of a similar total internal size. The new proposal is only apartments with a similar footprint. Height relative to airport runway rules. No change, still fully compliant. Method of construction – originally envisaged as being traditional build, the new structures may be from a panelised, timber construction following from the example of Trinity House and Tops of Sails. If they are they can be constructed quickly and very cleanly. We welcome any views you may have. Such views will be jointly received by those who support this and those who oppose this investment and would prefer no change. Both investors and opposition know each other well but have a variety of views so we are working together and sharing ideas to see how we can find compromise or agreement as we appreciate that change is not always welcome.